Start by mixing the egg replacer and milk in a large bowl until thoroughly blended. Mix in all dry ingredients and incorporate well. Lastly, mix in the remaining ingredients (excluding the oil). Form into small balls and fry until golden or dark brown. 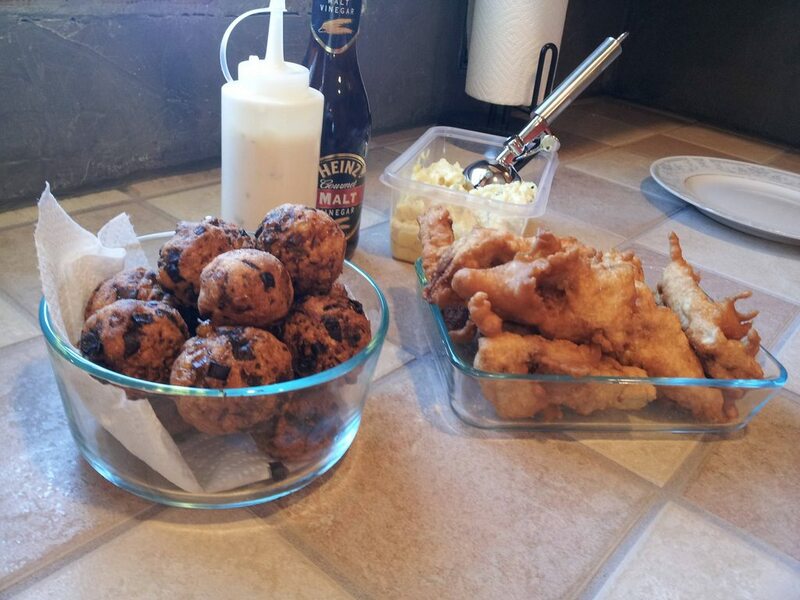 I like mine darker, so I deep fried them for 5 minutes in batches of 4- 5 at a time. Peel, or wash if you like the skin, potatoes and cut into roughly 1 inch cubes. Bring a pot of salted water to a boil and boil potatoes until fork tender, usually about 10 minutes. Drain and cool potatoes, If you mix the potatoes while they’re hot it will make for a gummy, gluey salad. If you like a chunky potato salad, mix the cubes with all other ingredients and chill for at least 2 hours before serving. If you like a smooth potato salad, mash the potatoes with a potato smasher or fork and mix in the other ingredients. Mix it all up and chill until ready to serve. I recommend making this the day before you plan on using it and letting it chill out so the flavors will be mixed throughly. It’s good to let any sauce have a 24 hour brewing time for full flavor. Hope you enjoy ! You could also serve this up paired with this coleslaw recipe as well.